A great way to protect your Auto investment, storage for household, lawn and garden items as well as a great work space out of the elements. Choose from one of our standard packages or give us your specifications and we will work out a material list for you. Each package can be tailored to your specific needs or requirements. We can supply your materials from the ground up starting with the rebar and concrete, to framing, roofing and siding or anything else you need to finish it your way. 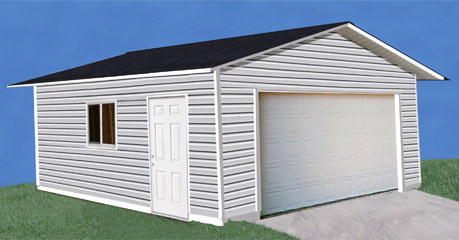 We can also supply you with the garage doors or even get them installed for you. Bring in your specific measurements or wish list for any size, style or wall-height and we can create a custom package designed just for your needs!